Ultralight, Ultra-Usable: Standard on all Tscopes. I call this scope "ultra-usable" because add that there is much more to "usability" than weight. 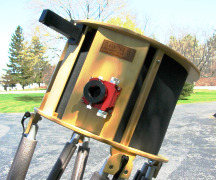 For example, many manufacturers claim that "most people" can use a telescope with a 66 inch eyepiece height without a ladder. That corresponds to the eye height of the average adult male, but that certainly isn't "most people." With an eyepiece height that is 3 inches lower, the T-14 will allow you to share your views with more people, more adult males and females as well as many young adults, without the need for step stool or ladder. You will also find that while the T-14 is light enough for an adult of normal strength to carry, it breaks down quickly into sections that each weigh much less so that there is practically no weight barrier to moving and setting up this scope. The upper cage features a low profile Moonlite CR-1 crayford focuser and a Rigel Systems' QuikfinderTM as standard equipment. The spider holds the no-tool secondary mount - just use your fingers for no-fuss secondary alignment. Using dowel pins to join the wooden struts to the cage rings saves weight compared to nuts and bolts and aluminum struts. 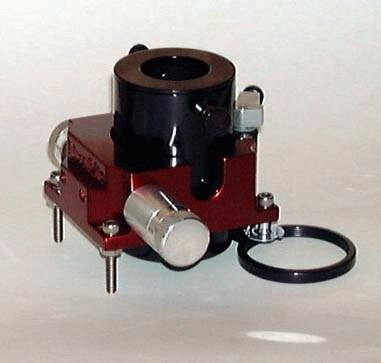 Any focuser you want is available as an option; please see the [ Options ] section for other offerings. Shown with upgraded Moonlite CR2 and Telrad finder. The bottom clamps are milled from solid Ash, the same wood used in baseball bats. All parts are captive and outside of the light path and with "no-tool" assembly - the T-14 will assemble in a few minutes... Yes, that fast! 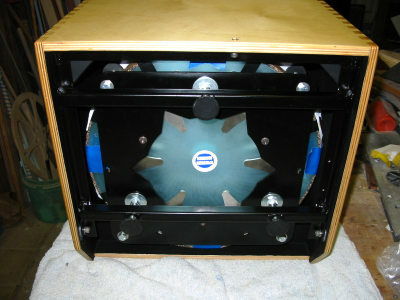 The photos shows the back of the mirror box with the mirror in its cell. If you look closely you may see the thermal scarf encircling the mirror. The thermal scarf helps the mirror cool down (or warm up) more evenly. The black steel frame holds the mirror centered in the mirror box and adds to the strength and stiffness of the mirror box. The steel frame can pivot on the lower two bolts to "tailgate" up and down for easy access to the mirror. The lower bolt holes are actually slots. 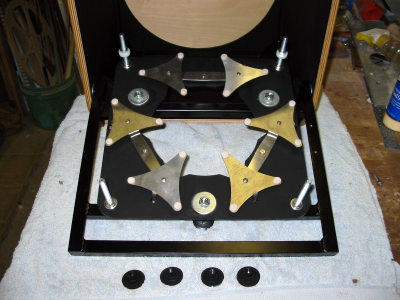 This allows very easy removal and replacement of the cell into mirror box - the frame slides onto the lower bolts and flips up; the mirror and frame will stay in place allowing both hands to be free to work the bolts to tighten it in place. 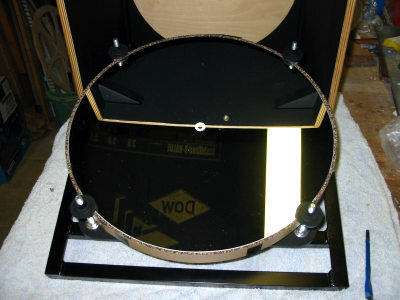 The mirror rides on an floatation plate that is designed so that the edge supports of the mirror also moves when adjusting the collimation bolts. 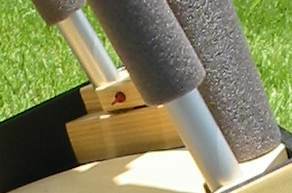 This eliminates edge strain caused by simpler edge supports. 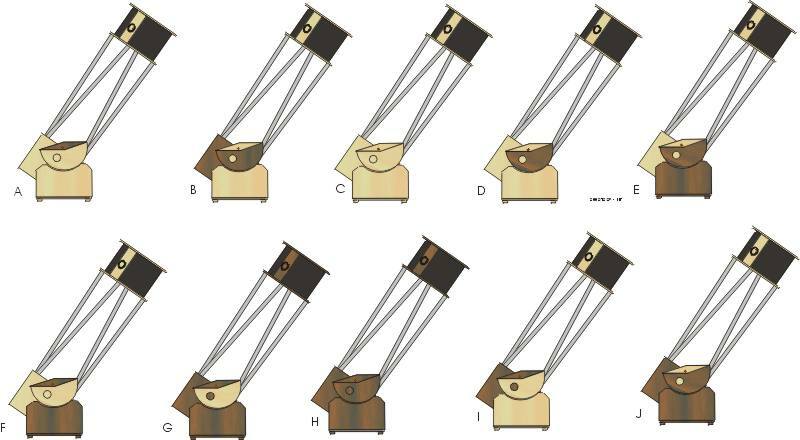 As an added benefit, this design does not allow the mirror to move from side to side like a sling would so the mirror cell (and telescope) is completely compatible with equatorial platforms. The inner cradle plate is ventilated to allow air to circulate freely around the mirror. Stainless steel "stars on bars" provide a total on eighteen supporting points for the mirror. This "18-point floatation cell" theoretically maintains the surface accuracy of the mirror to within approximately 5 nanometers, about 1/100th of a wavelength of light and our computerized part cutting insures that the built cell comes as close as posible to the theoretical result. Collimation bolts: The three collimation bolts on the back of the cell are extra strong "elevator bolts" that have been dipped in rubberized plastic for a comfortable, non-slip grip ... the coating will be especially appreciated on cold Winter nights. Joinery: Finger joints and dowel pins add to the strength and stiffness of mirror box and ground board. 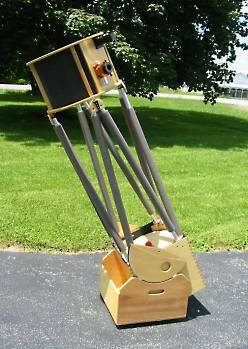 It's much more work than just using wood screws like other makers do... but then we never set out to make the second best telescope. "No profile handles" are also much more work than bolting on stamped metal from the hardware store. Better than a simple hole, these handholds are contoured larger on the inside to give your more gripping power. And I think they look good too. Seven virgin Teflon pads provide smooth movement against the pebble-textured laminate covering the bearing surfaces. The brass pivot bolt that joins the center of the two pieces is pre-drilled for a 1/4 inch encoder shaft. Encoder mounts: Encoder shaft mounts bolts for both the altitude and azimuth axis are pre-installed as standard equipment and are ready for your encoders and mounting arms. The set screw that holds your encoder shaft in place is nylon tipped so that encoder shaft will not be marred from setup and takedown. A TScopes exclusive: The altitude bearing mount is recessed to provide the lowest possible mounting profile for your altitude encoder ... the encoder will stick out less and be less susceptible to dangerous knocks and blows. 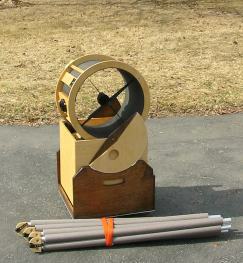 Helmsman Spar: This the "normal" finish put on wooden telescopes. It considered to be waterproof and is an excellent finish for exterior applications. The slight yellow tint of Helmsman Spar gives the wood a slightly aged and traditional look. The finish on your telescope begins with two hand-rubbed coats of varnish to insure the greatest penetration and protection to the wood then an addition four coats of varnish are sprayed on with our profession HVLP spray system. This results in a lustrous and durable finish on your telescope. Stain Patterns: Accent and more complete staining is available as an option. Please see the section below for a table of suggested staining patterns. Fine Print: Pricing and availability subject to change without notice. (They make me say that....) All parts on this page are covered by warranties from their respective manufacturers. Please see those pages for details. These special prices are available only with the purchase of a TScopeTM telescope. 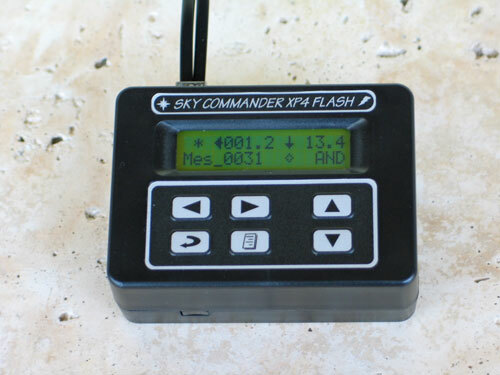 Specify wired or wireless DSC, includes 4000 tick encoders and encoder arms for each telescope axis. 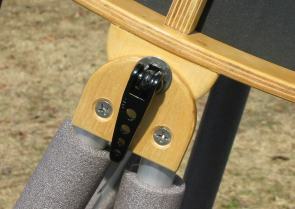 The Tscope DSC stalk tucks into the back side of the rocker box and is never in your way observing at Zenith. Perfectly sized for your Tscope DSC; please add $10 for larger version compatible with Argo Navis. - the weight: 65 lb.. Installed on your 14" Tscope: Tscope GOTO & Tracking controller, integrated digital fan and dew controller, cooling fan, digital setting circles, all cables, battery, bracket, recharger and Tscopes DSC stalk. "... the best newtonian views I have ever seen." The Peeless Optical Package includes a light weight and truly premium quartz (fused silica) mirror from Obsidian Optics and an upgraded 1/15 wave or better Pyrex secondary from Antares Optics. This is no trick of the numbers, your primary will be the real 1/20 wave wavefront" quality. (4 nanometers RMS.) Better optics not only let you see more subtle shades and detail on the Moon and planets but also perform better at setup time when the mirror temperature is still equalizing with the outside air. Better optics give better images. Always. Your favorite focuser isn't listed? How about a Starlight Instruments FeatherTouch with all the accessories for $295. Or something else? Just ask! The stretchy Lycra/Spandex light shroud pulls over the top of the telescope and gently hugs the truss tubes to nicely show off the angles of your new Tscope truss. It's made of the thickest/darkest material we could find; your satisfaction is guaranteed. Click on the image at right for some ideas of how well a little bit of Walnut stain perks up the look of the scope. I use just a touch of stain on the altitude bearings, "C" (no stain) is standard; however, you may choose either A, C or D at no additional charge. Want more? Want to pick your favorite stain color? Please do! Look at any of the suggestions and let me know what you'd like. Price includes sending you a stained and finished sample of your stain color prior to staining the scope for your approval. It's your scope, thank you for letting me build one for you. I know the importance of having your new scope set up your way ... Do you want your focuser on the left side? Do you need encoders but no DSC box? (Or maybe that "Argo Navis" that you've read about.) Please let me know... Some requests, like setting up your scope for left-side use, can be satisfied when your pre-ordered scope is being built at no additional charge. 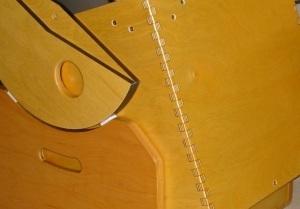 Do you want a special color wood stain or wildly colored light shroud? There may be an additional charge for some requests but please remember that I am committed to making quality affordable. Thank you. The T-14 is affordable, highly usable; it's and extraordinary value!